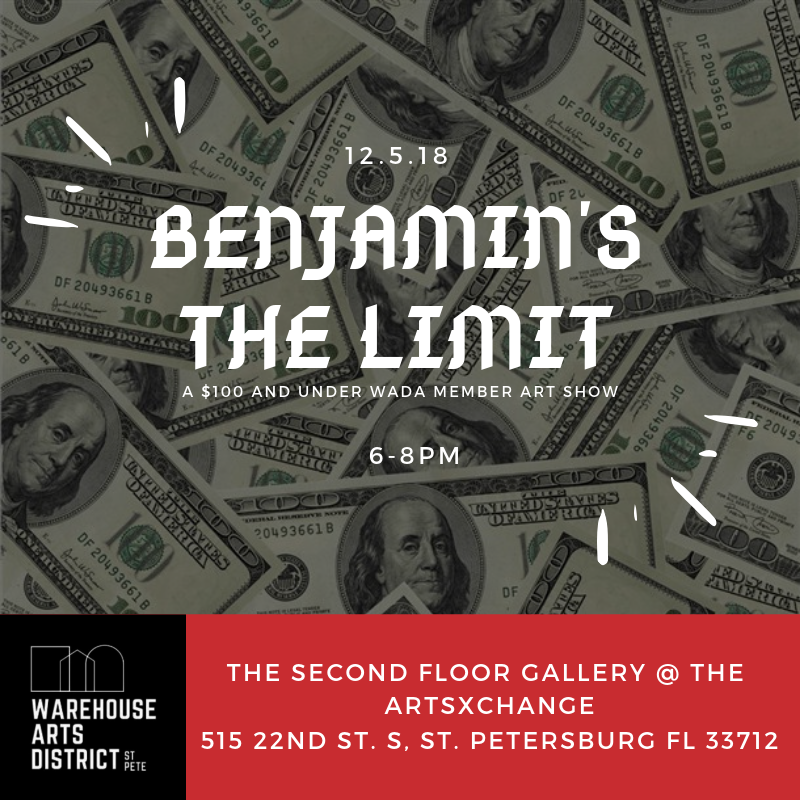 The Warehouse Arts District Association (WADA) is excited to announce our Second Member Show of the year in the Second Floor Classroom (now called Second Floor Gallery) of the ArtsXchange! Tis the gift giving season and in St Petersburg, it is always the art giving season! Think small, creative and affordable for this member show priced $100 or under (get it? - "Benjamin’s the Limit"?). Find any and all mediums - painting, jewelry, photography, sculpture, writing, and any other form . This will be creative and affordable! When you attend a WADA member show and either become a member or renew your membership, you can get a one year membership for a new member of equal or lesser value for free! This deal is only valid at the member show, so don't miss the member show Opening Reception on December 5 or come see it at the Dec 8 or Jan 12 Artwalk. Bring your friend to the WADA Community. The ArtsXchange is a project of the Warehouse Arts District Association (WADA). WADA’s mission is to build and sustain a vibrant arts community in St. Petersburg that supports the success of all artists and the community at large through a broad spectrum of tools, including community revitalization, marketing, advocacy and educational programming within the Warehouse Arts District. The ArtsXchange is home to 28 artist studios, a gallery for exhibits and events, and an education space for arts-related programming. Member shows are a benefit of membership.